The Arab Spring has returned to the Middle East after nearly six years in exile. It was in July 2013 that reversing the tide of democracy in Egypt that swept away the dictatorship of Hosni Mubarak, army chief General Abdel Fattah el-Sisi led a coalition with the backing of Saudi Arabia and the UAE to remove the elected President of Egypt, Mohamed Morsi, from power and suspended the the country’s constitution of 2012. The Arab Spring never quite recovered from that trauma. There is a nifty aphorism of obscure origin that ‘History does not repeat itself but it often rhymes.’ The return of the Arab Spring to Algeria and Sudan in the recent weeks fits into that description. The similarity with the past lies in the undeniable fact that the Arab Spring is riding the wave of anti-regime protests in both Algeria and Sudan, triggered spontaneously by enormous public hatred of the regimes for their brutal repression, corruption, indifference to poverty and the intolerable conditions of day-to-day life. In Sudan, the tipping point came four months ago over the government decision to triple the price of bread. In Algeria, the proverbial straw that broke the camel’s back came in February when then President Abdelaziz Bouteflika announced that he would seek a fifth-term in office, whereupon tens of thousands took to the streets. In the sheer spontaneity of the Arab Spring revolt in Sudan and Algeria, time seemed to stand still since 2013. First in Algeria, after some six weeks of protests, and in Sudan within days, after four months of protests, the dictators got ousted. But in reality, things are never quite the repetition of the past — protests this time around are on a significantly higher scale. Lessons may have been learnt from the tragic example of Egypt where a heroic popular struggle that brought the Muslim Brotherhood and Mohammed Morsi to power ended in the blood-soaked 2013 coup led by General Sisi. The tragic saga of the Arab Spring in Egypt showed that entrenched ruling elites do not relinquish power simply because of militant mass protests. However, the spectre that is haunting the masses in both Algeria and Sudan is the danger of bloody counterrevolution. Leadership is lacking among protestors and they lack the machinery or cadres to coordinate opposition to military-police repression. Meanwhile, the entrenched elite is co-opting the middle class and trying to lull protestors to sleep with (false) promises of a democratic capitalist future. The military junta in Algeria is promising to convene a constituent assembly to rewrite the constitution, while the counterpart in Sudan has voiced its intention to hold democratic elections in two years. In Sudan, there is also the added factor of foreign interference. Egyptian President Abdel Fattah el-Sisi openly said this week , “We cannot afford a leadership emerging in … Sudan that tolerates, or even worse condones, militant Islamic activity. 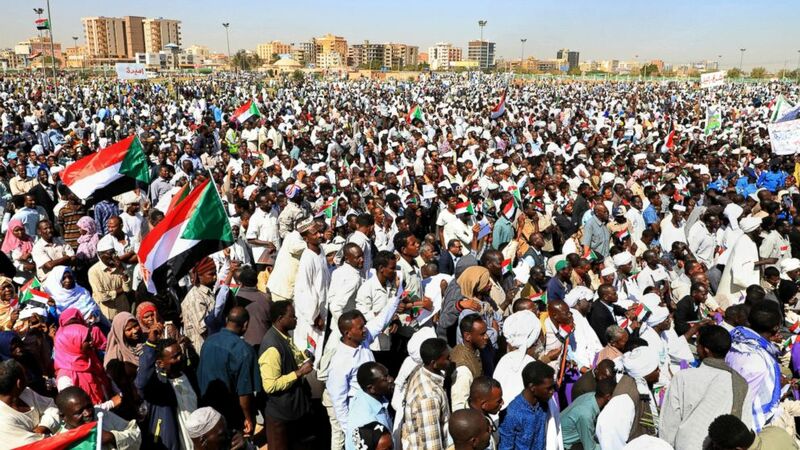 This is why … we are keeping a close eye on any possible transition of power in Sudan.” The reference is to the Muslim Botherhood. Of course, it is a phoney argument, since the Brothers in Sudan have historically rejected union with the Egyptian branch (forming an alliance instead with the Sudanese Ansar-Ummah political bloc in support of Sudanese independence.) Sisi’s real worry is that if Sudan takes the democratic path, Muslim Brotherhood that has dominated Sudanese politics will surge to take the elected leadership, as had happened in Egypt in 2011, and that would rekindle the clamour for democracy in his country too.